Typically very good uptime and excellent response time but customer service is poor and admin panel is dated. Their admin panel is slow and looks dated. 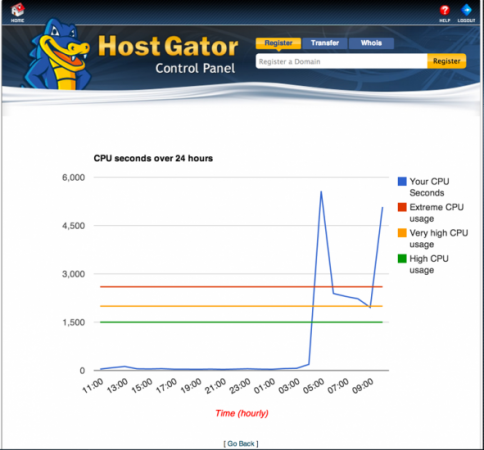 In terms of performance, HostGator is one of the better web hosts we’ve reviewed. It consistently posts uptime of above 99.95 percent and response time in the low to mid-hundreds. It’s also typically in the top 5 of our monthly rankings. On the flipside, it’s one of the worst web hosts we’ve reviewed for customer service. We’ve tested their live chat on a few occasions and we were left waiting around 2-5 minutes between interactions. We weren’t overly happy with the quality of the responses either. Moreover, like GoDaddy, it has decided to discontinue ticketing as a form of support. If performance is your primary objective then you’ll struggle to go wrong with HostGator’s cloud hatchling package; however, if you require a balance between performance and customer service you may be better off looking elsewhere. Like many web hosts, the price HostGator advertises isn’t the price you pay. The advertised price of the cloud hatchling package is $4.95 per month; however, you only qualify for that rate if you’re willing to pay 36 months in advance. If you wish to pay annually, or rather 12 months in advance, then the price is $95.40; if you were paying monthly, this would work out to $7.95 per month. To actually pay monthly for the cloud hatchling package costs $12.95 per month. Like many web hosts, the subsequent year of hosting with HostGator costs significantly more than the first “introductory year”. Upon your renewal date you’ll be charged $131.40, which like the first year is payable in advance. It also works out to a price increase of nearly 40 percent on the cost of the first year of hosting. While that may sound high, it’s not as high as other web hosts – FatCow and 1&1 charge 266 and 700 percent price increases respectively. HostGator’s domain pricing is similar to that of their competitors. It used to provide a free domain registration for every new cloud hatchling customer however no longer seem to. Strangely, the price to register a .com through its website is $12.95 but during checkout it’s $15. It also charges $15 for .com domain renewals and $14.95 per year for domain privacy. It’s also worth noting all domain name renewals are billed 30 days before the actual renewal date. Hostinger, which offers less features and doesn’t perform quite as well as HostGator, charges $8.99 for annual domain registrations and only $5 for annual domain privacy; however, likewise, it doesn’t provide a free domain name for new customers. It’s also arguably an unfair comparison, considering HostGator’s service is, in the first year, more than double the cost of Hostinger’s (and it costs even more in subsequent years). Like most hosts, HostGator places restrictions on server resources and these restrictions aren’t particularly transparent (that said, it does go into more detail than others). While shared hosting accounts “risk suspension” (or having their pages cached) if their CPU usage is too high (defined as 25% of CPU usage for 90 seconds at a time), cloud accounts are throttled and remain live even during high demand (they will be throttled until their usage returns to ‘normal’ levels). With each 300 additional seconds at maximum usage, the cPanel will be limited in increments of 25%. To make this all slightly more confusing, when you login to cPanel you’re presented with a tooltip over the metric ‘CPU usage’ which states: “it’s best to ensure your scripts do not consume more than 25% of the server’s CPU resources for a duration of 90 seconds at a time”. As an aside, there’s an image on a HostGator help page (see below) which stipulates that just under 3,000 CPU seconds over a 24 hour period is “extremely high usage” (compare this to Siteground which permits up to 10,000 CPU seconds over a 24 hour period). We contacted a sales representative to verify this, however he said such limitations aren’t placed on HostGator accounts. Like many hosts, they advertise bandwidth as “unmetered”, which means it isn’t monitored. They’ve also recently begun offering free SSL certificates. HostGator offers website migrations free of charge (a lot of hosts either charge a premium or don’t offer this service). It also offers a 45 day money back guarantee (which is better than a number of comparable web hosts), however it’s not clear if this applies to cloud hosting (as with the uptime guarantee the terms of service state it’s exclusively for shared and reseller packages). Live chat representatives inform us it does. It offers a 99.90% uptime guarantee; if it fails to honor the guarantee it ‘may’ (direct quote from its terms of service) credit you with one month of free web hosting. However, again, there’s no mention that the uptime guarantee applies to cloud hosting (HostGator states it only applies to reseller or shared hosting), however live chat operators inform us it does apply. HostGator seems to be lagging across the board when it comes to updating their help pages to include information on cloud hosting, and we suspect this is because it’s a relatively new service. Disappointingly, backups don’t appear to be included as standard (which contrasts with other hosting providers at or below this price range), apart from a single weekly backup which overwrites all previous backups (again though, their terms of service state this service only applies to shared or reseller services). There are options to do manual backups of your website through cPanel, which is a plus (some web hosts have disabled this functionality). The admin panel isn’t great. It appears to be a cPanel installation but we found it to be quite slow – and we’ve got a very fast connection – and a little disorientating. One upside is the scalable resource option available on the homepage of your admin panel. It allows you to upgrade at the click of a button and also gives you some insight into existing usage.